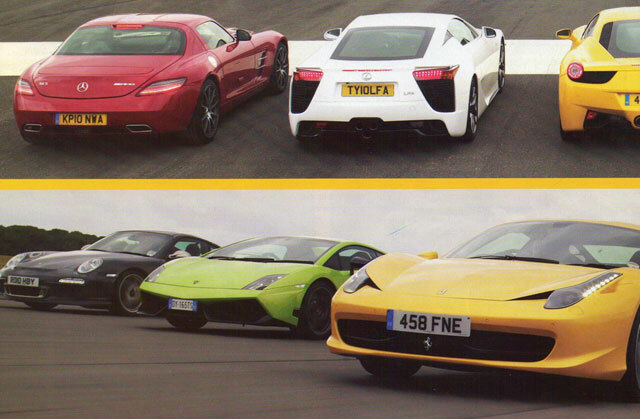 At long last, some kind soul at Toyota Nation has scanned the Top Gear magazine article that pitted the Lexus LFA against the Mercedes SLS AMG, Ferrari 458 Italia, Lamborghini Gallardo Superleggera & Porsche 911 GT3 RS. [The LFA is] also the number one crowd-stopper and though not all the people we spoke to like it, everyone wants to know what it is. [The Stig’s] feedback was that, even with the traction gizmos switched on, the LFA is a knife-edge thing, one that instantly wants to get cozy with the limit. It’s the sort of car that needs to be driving accurately. Ditch the safety stuff and you’re on your own. It’s as mad as its V10 exhaust howl. Uneven or not, this Top Gear article is still a fun read — and should you have the same issue I had reading the scans, I’ve found a more conveniently sized zip.